A pirate captain of the Inner Sea, Torius Vin makes a living raiding wealthy merchant ships with his crew of loyal buccaneers. Few things matter more to Captain Torius than ill-gotten gold-but one of those is Celeste, his beautiful snake-bodied navigator. When a crafty courtesan offers the pirate crew a chance at the heist of a lifetime, it's time for both man and naga to hoist the black flag and lead the Stargazer's crew to fame and fortune. But will stealing the legendary Star of Thumen chart the corsairs a course to untold riches-or send them all to a watery grave? Didn't even finish the first chapter. Terrible performance ruined a good book. Do yourselves a favor and skip this one. The best thing about this book is how it takes many familiar aspects of pirate lore and yet give them a distinctive level of detail that sets it apart from many other ‘traditional’ tales of the Seven Seas. It is refreshingly diverse tale in its story as well as characterization and settings. People of Color Characters: Check. A culture that is not based entirely on Western Culture: Check! This book hits all the right marks and makes into a clear step in the right direction for writers of fiction while maintaining enough familiar threads to engage long time readers. There is plenty of swashbuckling, high seas action to sate any reader familiar with pirate lore but it takes itself in its own direction that makes it unique. This book takes place in a region of Golarian, the world that Pathfinder takes place in, called the Inner Seas. Unlike a lot of other pirate fiction which is more or less inspired by the pirates of the Caribbean, this book takes a great amount of inspiration from Arabic culture. Torias and other characters are often described as wearing turbans and kaftans and other such garbs and the main antagonist of the final third is described as having dark skin along with other inhabitants of his realm. The importance of diversity in literature cannot be understated. One of the best aspects of the entire novel is the relationship between Celeste and Torias Vin. For starters, while interspecies relationships are not exactly new territory for speculative fiction writers, this one is one of the first where Bookworm one where it was explicitly between a human and distinctly non human character. In this case, a lunar naga in the form of Celeste. For those unfamiliar with the world of Pathfinder, Lunar nagas do not have arms and manipulate objects with magic. They are nocturnal, venemous and can shape shift for brief periods of time. As one could expect, this would create some sharp divisions in a relationship. Celeste is very strong and memorable as a character who possess a certain innocence about her alongside her badass magical skills. Other memorable female characters are the courtesan Vreva Jhafae and the gnome Snick. These and other characters really make this story and each one had a distinctive voice that could be recognized regardless of the context. Just hearing these characters talk to each other was entertaining on its own. This book is not afraid to tackle some important issues that readers can take with them into the real world. What constitutes a healthy relationship is one of them. Without giving too much away…there is a real crisis in the relationship between Torias and Celeste that can leave the reader on the edge of their seats. It doesn’t feel like the forced contrivance that so often plaques fictional romances, it actually feels like something that would crop over the course of such a relationship. While Bookworm did enjoy such a plot thread, they can see how some readers would not be so enthusiastic. Indeed, at times Bookworm did want to get back to the action and not awkward conversations between the pirate and the snake lady. We came here for swords and magic not relationship drama. Thankfully, it is only a single part of a very wide ranging story with plenty of action. The theme of addiction and its devastating consequences is a central theme to this novel. Drugs crop up fairly frequently in speculative fiction but rarely does addiction. The text is not afraid to confront such things in manner that feels realistic rather than preachy. Major kudos to the author for daring to touch upon such a sensitive issue. The Final Verdict: The best part in reading this novel is that it does not require intimate knowledge of the Pathfinder Universe. This novel can stand on its own as action-packed seafaring adventure with colorful characters that anyone can enjoy. this is a wonderful pirate tale. a long con, swashbuckling and dealing with love and betrayal. who could ask for more from.an adventure story. 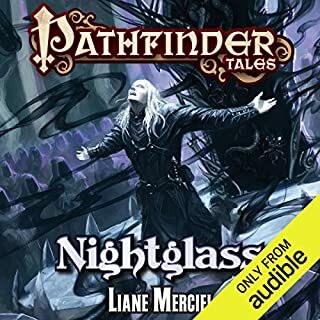 I listened to this based on liking "Pirate's Promise" by the same author set chronologically after this one. 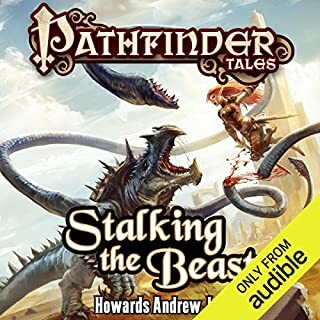 If you want an easy to listen to pirate adventure set in the Pathfinder universe I would start there. It summarizes this book neatly before getting it's own story going and you do not have to slog through listening to this. This one was a struggle. The plot is that this pirate crew is going to pull off an elaborate heist and manipulate their way into a bunch of money. It hinges on the naga character Celeste being able to transform into a human often enough and for long enough to convincingly pretend to be an oppressed slave concubine in the presence of their target and seduce him to the point he is malleable to the pirate crew's ends. So there is much to do about whether Celeste can convincingly seduce a man, and how she feels about it, and whether or not their target "really" likes her or or is just responding to all the seducing and charm magic and drugs they slip him, and is he truly a good man or not?, and since Celeste's true love is supposed to be Captain Torius Vin how does HE feel about all the seducing and manipulating? For all that this is a book about pirates it feels more like a cheap romance. The focus was almost totally on the romance with very little action to break things up. Romance is fine when it is done well but for me it was not here. The whole premise of Celeste feeling doubts about seducing the slaver man because maybe he's actually a good guy is infuriating. From the reader perspective the slaver man is obviously a bad dude and Celeste thinking maybe he isn't comes off as extremely naive on her part and completely out of character, especially given what we know of her backstory. 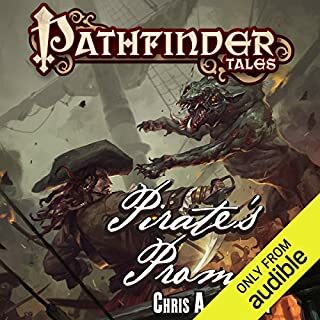 The next book, "Pirate's Promise", manages some of these themes and dynamics far better and in a way that is actually compelling and does not detract from the story. At least the ending of this book wraps everything up in a satisfying way and keeps the experience from being a total annoyance. I would not listen to it more then once though. John Pruden does a good job narrating again. He adds a little bit of campiness but in an entertaining way. A great story with interesting characters! 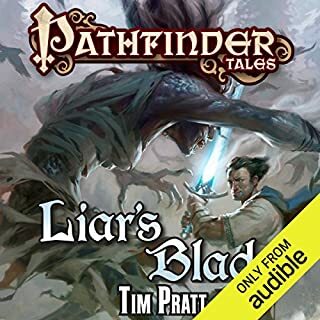 The Pathfinder games and comics are all interesting.... but this story and all the varied characters was very descriptive and enjoyable, time well spent! 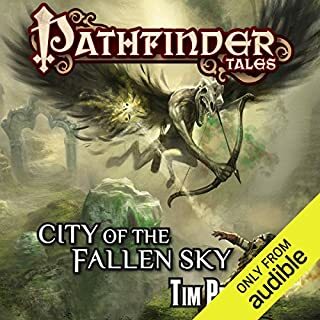 Read this if you like pathfinder and/or pirates. Fun cast of characters that should make for a great series. Make sure to read Stargazer first, of you like me and want the full story. This book surprised me a little. I went into it expecting a Pirate adventure on the high seas. What I actually got was an Ocean's 11 style heist story with very little action. Don't get me wrong, I enjoy a good heist story too, so I did end up liking this book. The main plan revolving around the plot was pretty complicated and some parts of it were not really made clear from the beginning, so I was a little confused at certain points, wondering where this was all going. On the positive side, I thought the characters were all fleshed out well and very colorful, with their own personalities and quirks. As far as the narration, it did take a little getting used to. I had to get about 4 chapters in before I could really focus on the story, and I didn't really like the voice he settled on for the main protagonist. I thought everyone else sounded good though, and once I settled in, I found it was mostly a smooth listen. I have this book physically and had a hard time getting more than a few chapters in. however this made me delve much further into the story. It took me a little while to get used to the reader. often the voices he used for some of the characters got swapped, but I have been told I am overly critical on things like that. I still enjoyed the cadence of the reader and hopefully look forward to him reading the next story. 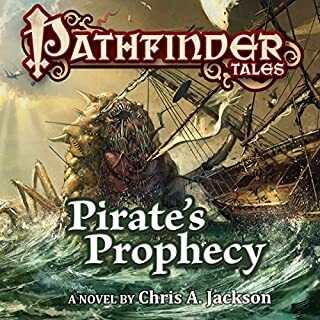 I love fantasy stories with rogueish type main characters, Chris Jackson's depth of knowledge of how ships work and interact are woven perfectly into this story and give a great insight on shipwork and ship crews that many in the same genre overlook. All I was hoping for and more. Fun characters all around and lots of unexpected twists to keep me interested. 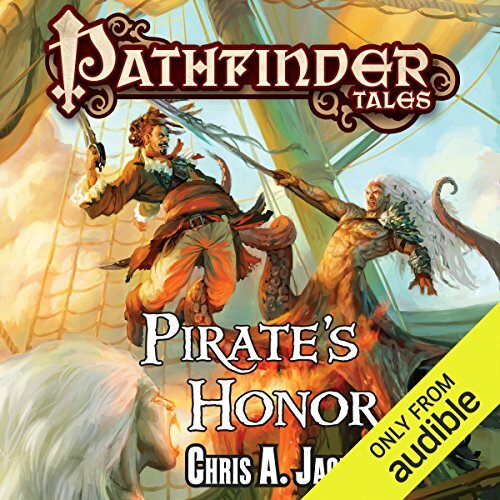 I rarely expect much from licensed stories like this but, although the narrator's protaganist voice sounded quite a buy like Maxwell Smart, i couldn't help but enjoy Pirate's Honor. Dont expect Tolkien or R R Martin and youve got a fun little book.